I’ve seen some big numbers in my day–I’m not boasting, but check this biggun: 8008135–and while I’m generally cool and collected in the presence of big numbers, I did mutter “flipping heck!” at the belter I’ve just seen in the company of Rocket League [official site]. 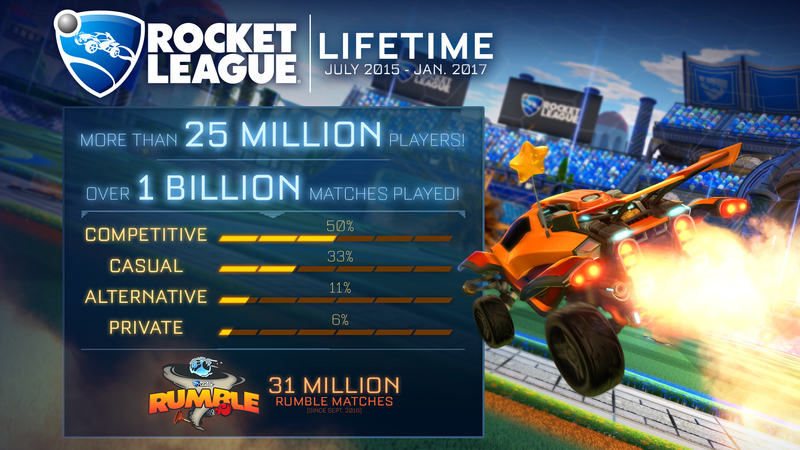 25 million players have carballed, developers Psyonix announced today, racking up over a billion matches between them. Those are big numbers for any game, let alone the follow-up to a PS3-exclusive game about sentient cars playing football. Good numbers, you lot. I mean, I’ve known bigger numbers–80081357, for starters–but that’s still some great numbering.I’m not surprised that it’s popular, seeing as Rocket League was our favourite game of 2015 as well as one of Steam’s dozen highest-grossing games of 2016, but hearing it’s quite this big is grand news. I’m always glad to see futuresports admired widely. Psyonix have put together a picture with some extra numbers and those squiggly % signs to break down how popular different modes are. Competitive is top, obvs. The numbers are shared across all platforms, of course, but as PC players can carball with PlayStationeers and Xboners we’re all winners here. Well done, everyone. Tagged with big numbers, Psyonix, Rocket League.